Troop 123 goes camping at least once a month. January's activity is Merit Badge College - January 20, 2018. 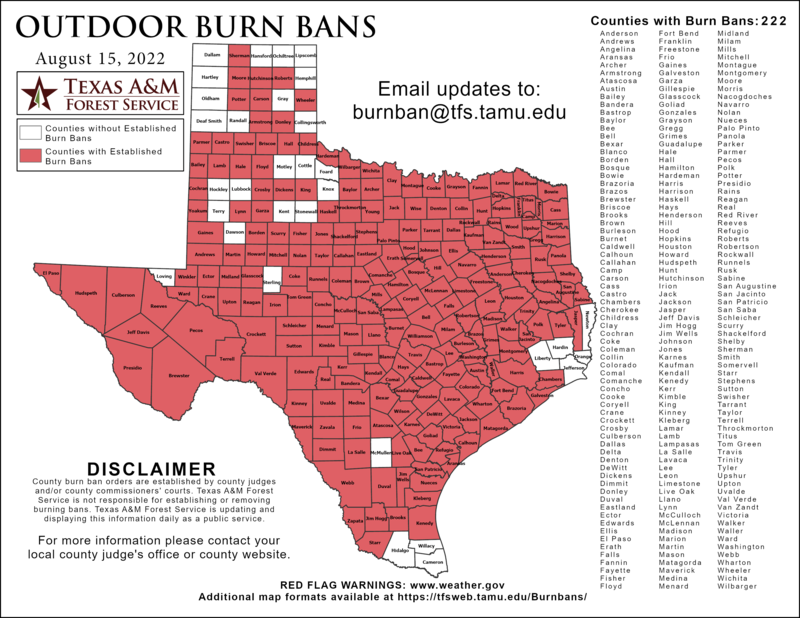 Burn Ban Map for Texas. New Scout? or can't remember what to pack? The Camping Equipment Checklist is designed to help the new Scout pack properly. Are you the Grubmaster for this campout? This worksheet can help you. The Scouts rotate the Grubmaster duty to fulfill rank requirements. The designated Grubmaster can use the Menu Plan worksheet (click on icon at left) to help prepare duty rosters, menus, determine meal supplies, and calculate costs. Need equipment for the campout? The Scouts and the Grubmaster use the Quartermaster Equipment Checklist (click on icon at left) to record what equipment they will need for the campout. The checklist should then be given to the Quartermaster so that the Quartermaster can ensure that the proper equipment is loaded onto the troop trailer before the campout. The Patrol Camp-out Planning Sequence can be used to help a patrol plan activities for a campout.